This year all my kids are participating in NaNoWriMo. Past Octobers have been crazy enough, with my older daughter asking for advice and plotting away---changing her novel ideas as often as her Halloween costumes. This year I have three storytellers, all acting out scenes and trying out ideas on each other. You may be scratching your head at this. Isn't November the novel writing month? Oh yeah. Definitely. November is all about the writing. That's why October is all about the planning. If you have kids who love to write and haven't checked out the Young Writers Program (YWP) on NaNoWriMo, you really should. YWP NaNo offers great support and young writers are allowed to set their own word goals. Fifty thousand words is a great length for adults, but kids need to start with kid-size novels. NaNo even offers age-appropriate materials for novel planning. That planning happens in October. 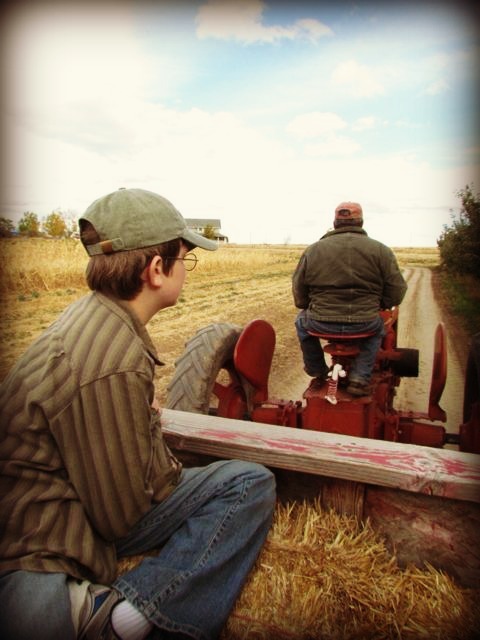 So yes, this is the time of year for the traditional hayride and visit to the pumpkin patch, but it's also the time of year for story-planning. In practical terms, that means a weekend full of carving pumpkins and creating characters. 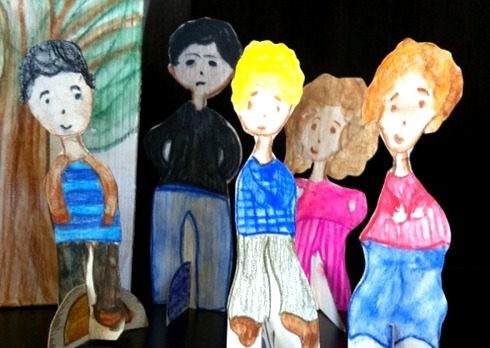 To assist in character creation, the kids and I made paper dolls using Carla Sonheim's directions. We love Carla's books and often use her ideas as starting points for our art explorations. So how did it go? Really well! My youngest created only a few people, but ended up expanding the physical world for her characters. She hadn't given much thought to where they lived, so we built a house for them out of a mac-and-cheese box and she told me all about their likes and dislikes. My oldest laughed as she imagined the comments her characters would make about her imperfect drawings. "Death hates his sweater," she told me. And middle child? The one who drags his feet on most school projects? He created two characters and started seeing tension between them. He doesn't have his story nailed down yet, but he has a dozen options that will work. And me? I realized once again how many characters I've developed in Claire's world. The exercise was a good reminder for me that my NaNo novel cannot contain all of them. I am a visual planner, so just gazing on the available characters helps me to stay focused. When we'd finished with our creations, we shared with each other, explaining something about each character. After I told a bit of background about one, Littlest patted the doll on the head. When my son described one of his possible plots, his paper figures started fighting. Play is an amazing way to develop stories. Next week we'll incorporate costumes and role playing into our novel building---and then we'll go trick-or-treating. Hallo-NaNo-ween is quickly becoming my favorite time of year.